Poster for Guerrilla Girls group exhibition at Palladium, 1985. Gallery 98 has created a timeline of the “Downtown Era,” drawing from our extensive inventory of gallery invitations and posters. 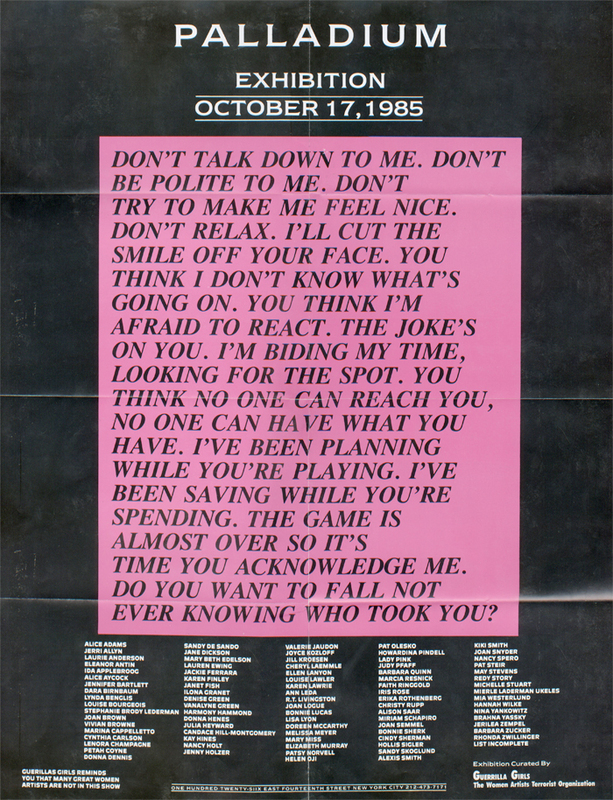 The spirit of the period is evident in this 1985 poster, for an exhibition curated by the Guerrilla Girls at the nightclub Palladium: what proved to be an uneasy meeting for two of the era’s growing trends, nightclub exhibitions and political art. A self-proclaimed “women artists terrorist organization,” Guerrilla Girls had formed earlier that year to expose the art world’s extreme gender imbalances, surreptitiously pasting posters around New York City. The Palladium, the 14th Street mega-club decorated with major works by contemporary male artists like Julian Schnabel and Jean-Michel Basquiat, had initially been a target of the Guerrilla Girls’ ire. Many of the group’s anonymous members would later regret accepting the club’s olive-branch offer to host an all-women exhibition curated by Guerrilla Girls—a new tactic that the group would never repeat.